"It is also obvious that had December not been such a warm month, 2014 would have been much cooler." I think he could have expanded on that line of thought and said that had not the months of January through November not been so warm, 2014 would have been much, much, much cooler! Mr. Jay, condescension is not an argument. It continues to surprise me that you so frequently, when confronted with an argument, dismiss it on the grounds that you question the writer's credentials. Selecting one small piece of the presentation and resting your attack on it alone, when it does not go to the essence of the argument, is not a cogent response. I have to take issue with your choice of title, as the linked article does not support either the British government Met Office (their EPA) or British climate establishment (HADCRUT) admitting this “warmest year” thing as being “unconfirmed”. At most we can say is the writer of your linked article makes the case it is unconfirmed using the Met Office’s own data and observations, but giving it a more honest spin. The Met Office very clearly does claim it was at least as warm as 2010 (see http://www.metoffice.gov.uk/news/release/archive/2015/2014-global-temperature ), but then fails to give us the same depth of contextual analysis as Dr. Whitehouse (re error bars). The M.O.’s choice of wording suggests this was the warmest year on record (however marginally) before dismissing questions of context such as Whitehouse raises. I also found surprising you made such a strong case for Britain being at the vanguard of the warming movement. You are right, of course, but it is unlikely many will know what Britain’s role was in founding the movement, or recall its early development as we do. A little history, therefore, is in order; so, I have provided a few links to that end below. Longtime skeptics John Izzard and Tim Ball make a good case for Maurice Strong (a Canadian) having been the creator and organizing genius behind the warming movement (see https://climatism.wordpress.com/2013/09/17/the-creator-fabricator-and-proponent-of-global-warming-maurice-strong/ ). Clearly, the warming idea did not originate with Strong, but he was casting about in 1971-1972 for something as would provide him leverage in a UN power struggle concerning his idea for imposing a ’nose-of-the-camel’ tax on member nations. Before we get too far into the question of ‘who started’ the movement, we must recognize there was no one person, group or government that started the movement. Strong is simply an early and exceptional case of advocacy for less than altruistic (i.e., hidden agenda) reasons. In his interview, he never admits his real reason for supporting the movement was his ‘we must have a [socialist] ‘one-world’ government’. Nor does he reveal he was one of the lead organizers of the Stockholm conference and other events touts in the interview; as launched the movement and ultimately lent it enormous resources, legitimacy and governmental backing. However much Britain may have contributed at the start of this movement, our own contribution to the problem must also not be discounted. Recall a very big lead-in to the warming crisis was its predecessor the ‘ozone-hole’ crisis; and that was a mostly homegrown movement to stop something over which we have negligible influence. Moreover, it has been the USA that has provided the lion’s share of superstars of the movement (Hansen, Gore, Mann, Kennedy Jr, Oreskes, &c) and funding. What folks should take away from all this, is not that 2014 was the warmest year on record since tracking began (possibly true with a 38% probability), nor that temperatures have paused in their march toward some unprovable projection. What they should take away from this is that warming in the last 16-18 years has been not only far less than the IPCC rates of rise (0.2-0.3C/decade) predicted, it has been even less than that observed in the period 1948-1978 of +0.02C/decade, which was a similarly flat era (see http://www.ncdc.noaa.gov/sotc/service/global/global-land-ocean-mntp-anom/201301-201312.png ). Instead of banner headlines telling us of record warming in 2014, our media and officialdom ought to be reporting 2005, 2010 and 2014 in a virtual dead heat. What we are seeing is a highly stable, if somewhat elevated climate. Or, putting this another way, where’s all the climate change we’re supposed to be dreading? "our media and officialdom ought to be reporting 2005, 2010 and 2014 in a virtual DEAD HEAT"
may have been an unintentional pun on what will happen to us if we ignore the problem, but it points out the fact that even the climate change deniers do not contest that 2014 was among the hottest on record. When a silly argument is made to counter overwhelming evidence, it is not frivolous to point out the gaping holes in the writer's thought processes. This writer was telling us that the only reason 2014 was hotter than usual was that 2014 had a warm December. That is like telling us that the Patriots would not have won the Superbowl except for the fact that they scored a lot in the fourth quarter. The silliness is not ours, but yours. Silliness is pretending to understand completely things you clearly do not more than vaguely, and exposing yourself to ridicule at every attempt. Silliness is thinking yourself entitled to monopolize or stifle opinion. Silliness is pretending to an intellectual superiority not supported by demonstrations of wisdom, study, insight, honesty or a willingness to learn from past mistakes. Silliness is continuing to cling to ‘scientific consensus’ despite consensus is irrelevant to science. Silliness is invoking an “overwhelming [body of] evidence” where none exists. Silliness is repeatedly butting your head against the same unyielding wall of fact expecting a different outcome. But, most of all, silliness is stooping to insults wherever, whenever arguments fail you. Your analogy, while not altogether incorrect, is also woefully superficial and misleading. A warm December making an otherwise warm year register as ‘hot’ is more like the trailing team having benefit of a ‘ringer’ introduced into the game in the last 3rd of the final quarter to alter the outcome. Unlike a football game with its fixed rules and goals, climate is chock full of such ‘game changers’. It also has no ‘team’ to speak of, because it is indifferent to petty squabbles over how it should or should not behave, and goes its merry way as though we do not even exist. For man-made warming theory to be valid, nature absolutely must take note of our influence over it, however modest; which, so far, it hasn’t. For climate models to have validity, they absolutely must have sufficient predictability as makes them marginally accurate (90% would be convincing, but certainly better than the less than 1% track record so far exhibited. Globally-averaged temperature over the next couple of years should be easier to predict than next week’s temperature in your own backyard. Yet, the models your whole proposition rest on, fail even at that because they are rigged to show warming, and only warming. To be reliable, models must be accurate predictors of a future trend, as well as the past data on which they are calibrated, but to that, they must also thoroughly comprehend and reflect the actual rules by which nature plays ‘its games’, and even our modelers admit they are far from accomplishing that. Both the theory and models predict a generally upward trend. They do not predict and are incapable of predicting a flat temperature trend of more than a few months without some deliberate biasing as would reverse the constant biases (aka, fudge factors) already built into them by their creators. Such adjunct biasing, in order to mimic the observed data, would need an on/off switch, and that is just cheating in such way as would invalidate the whole point of modeling. The most recent data supports a continued warm trend. It does not support an upward or ‘warming’ trend (aka, ‘climate change’) as predicted by the models over a much longer period than current theory can admit. Some will no doubt argue this pause is simply an unforeseen forcing (e.g., PDO, weak, &c) temporarily suppressing the normal trend which is generally upward, and that things would have been much hotter already except for this as yet undiscovered forcing not in the model. However, El Niños and PDOs do not span decades and cannot explain such a lengthy pause. Moreover, arguing an unforeseen not already in the model simply admits to something we have always argued, which is that the models are deficient with regards to some major (non-human) components of climate, most of which are hard to impossible to model. Let’s say our modelers, instead, decide to simply change the biases already have in their models, but avoiding on/off biases as will make their models immediately suspect. The result of doing that would be a shallower trend-line that comes much closer to the observed data (including the last 17 years). If you recall, three IPCC Assessment Reports back, the models were claiming a 3-6˚C/decade increase. 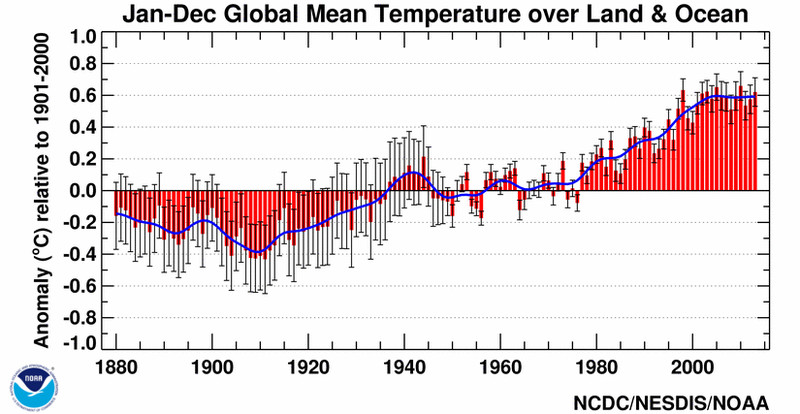 Next, it was revised down to 2-3˚C/decade, and the most recent AR has it at 1.5-2˚C/decade. If they revise it any lower, they may as well admit here and now the observed warming is 99% natural, and that there is not enough ‘human-warming’ influence as matters. Unlike the warming-obsessed, we mere skeptics are open-minded enough to understand and allow nature plays by its own rules, and if scientists are ever to understand those rules they must be willing to learn from and adjust their models to allow for natures frequent ‘game changers’. More precisely, they must identify and model all the rules under which those ringers enter the game to upset more constant factors, and must not overstate/understate any other factor simply to gratify some preconception or agenda. Over the course of many discussions of climate within these pages, I have introduced a number of such climate game changers, all of which are excluded from current models for the simple and admitted reason our climate modelers are unclear how to even approximate such ‘maverick’ effects, most notable among those being the Sun, for which we lack even the rudimentary means to develop algorithms. Climate-scientists (those defending the models) admit these are true game changers, but then make excuses for downplaying them in the models as is unconvincing to anyone with half a wit and makes the effort to study their methods and cheats. From a combination of hubris and political motivations, many of our more ‘invested’ climate-scientists (many of them quite brilliant) have become stuck in a quagmire from which they can neither go forward to a more complete and believable model nor retreat to some position more defensible. Instead the hide behind false declarations of ‘consensus’, exert influence to stifle critics, dominate and corrupt the peer-review process, improperly and stealthily alter data beyond redemption, hide well-known climate features (e.g., “hide the decline” and “must get rid of the MWP”) and resort to smearing their critics as ‘deniers’ in a futile attempt at staving off exposure. Recently, they have been plagued by one scandal after another, each calling attention to scientific fraudulence on a massive scale; which in any rational world would result in dismissal. That it hasn’t only shows how well entrenched they are and how powerful their patrons. This is no longer about science, and that is the great pity. It is now more about saving a few careers (built on an unreasonable expectation science would ‘deliver the goods’ within a few short years) and pensions, on corruption and greed, and, ultimately, about ego (i.e., saving face, reputations, &c). Once again, none of us are ‘denying’ it is getting warmer. I believe I made that clear enough in my last post. What we dispute is that ‘warming theory’ deliberately misrepresents human influences on climate, and it is our contention that is grossly overstated in all the models on which you warmist rely to make your argument preemptively condemning otherwise harmless human behaviors; effectively enslaving us to a travesty of science. I have no problem with the science, and I applaud the advances that have been made thus far in our understanding of climate. I do have a problem, however, with overstating the science’s ability to predict, with a science that has been high-jacked and corrupted to serve political ends, an agenda that has as its main objective a tight and total control over human behavior; which is what this is really all about. It is because nanny-state types like you favor such an agenda that you abet this stifling of critics (however mild or helpful), and resort to epithets like ‘deniers’ out of desperation, fear and loathing. We also have answered the “problem”, as you call it, which is more in the mind of shameless self-promoters (e.g., Al Gore) and their easily stampeded dupes as does not warrant turning back the clock on our way of life. We have shown many times, the predictions of disaster are highly inflated and fail to account for the time spans over which they occur or of the proven adaptability to what are, in all truth, only mild and changes; which are, in any case, beyond our poor powers to influence one way or the other. Even if we suddenly stop every bit of emissions attributable to us, including that of our livestock, the warming will continue to rise. Storms, floods, deep freezing, drought, glacial melting, hot spells and the like are not new to this century, only the adjectives used to describe them are more ‘extreme’. You claim repeatedly of “over-whelming evidence” for man-made warming, yet not once in all of our discussions have you shown us such evidence or where to find it, and I doubt you have ever bothered to look (other than to stand at the foot of some glacier while some equally convinced tour guide painted a painful picture of disaster which you dutifully swallowed - hook, line and sinker); and haven’t done even that because you doubt your own capacity to understand the very science you insist others must submit. I do not claim to have studied every bit of it, but I have studied both the data and the models enough to know they are NOT overwhelming, and are ultimately unconvincing because of a poor record of prediction. At best, they are immaturely promising and at worst they are manipulated and corrupt. You are right “it is not frivolous to point out” a mistake, but it is frivolous (and disingenuous) pointing out mistakes where none exist or are irrelevant to the topic at hand. You complain of “gaping holes in the writer's thought processes”, yet fail to tell us what mistakes you found. I found none in his presentation, reasoning or conclusions, so beg of you to enlighten us what we missed that you did not. Sorry J Jay, but you are a pretentious windbag and humbug who must ever disparage what he cannot explain away. Your assertion of ‘holes’ is just one more of many ruses. Previous entry: What Hath The Fed Wrought?